Life as Pink Einstein | Dallas Fashion and Lifestyle Blogger: Dressing Room Outfit Ideas for Easter! 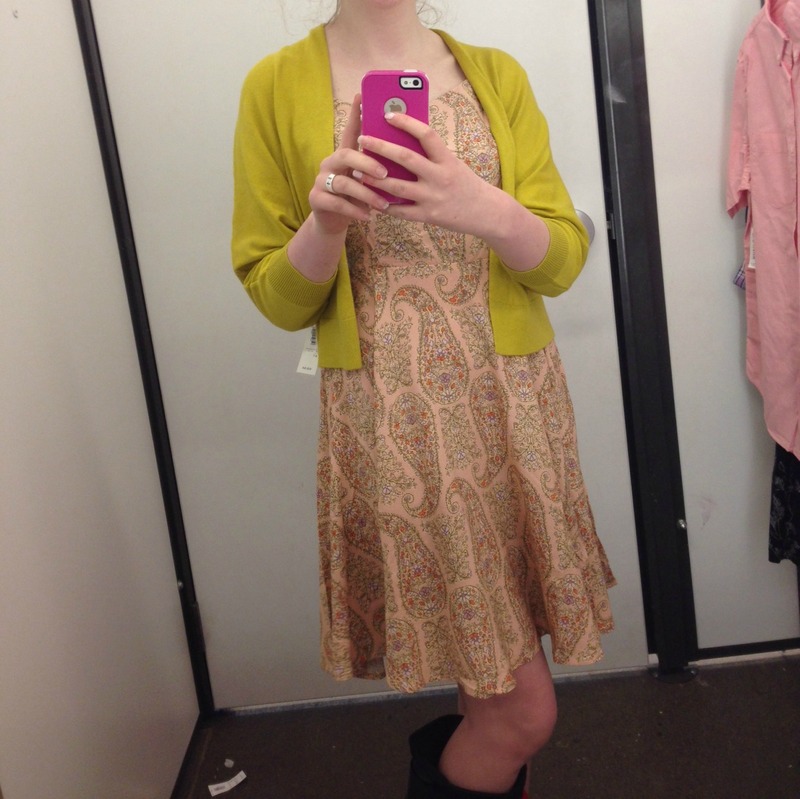 Dressing Room Outfit Ideas for Easter! So Easter is tomorrow and I didn't have an Easter dress yet so yesterday my dad and I were sitting on the couch watching TV and an Old Navy commercial came on for their huge dress sale so we went. Oh my goodness is that store overwhelming! That was only my second time to go to one and there was tons of people and tons of clothes. Their commercial wasn't lying though, they were having a huge sale on practically the whole store. I didn't plan on buying anything but one Easter dress and maybe a sweater to go over the top so I took pictures of the dresses I tried on to give you some Easter outfit ideas and ended up getting a lot of the things I tried on which I will show you in a sperate post. 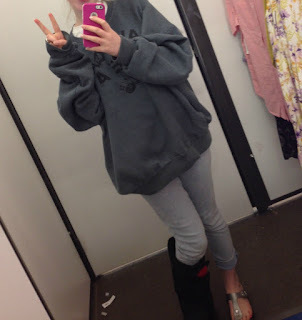 So I go into the store looking like this with my crazy curly hair that looks like I have dreads, my over sized Big Wheel sweatshirt, my Fraggle Rock tee, and my light wash jeans, something I normally wouldn't wear to go clothes shopping but I just wasn't feeling the whole get dressed up vibe. So here is outfit 1, a super cute red printed dress with a white denim jacket over the top. The dress had a high necked top and was tank top styled, super cute but I think it would be to cold to wear without the jacket on Easter. This next dress is the same pattern as the other but with long sleeves and it had a slit in the front that came down kinda low which I didn't like. I'm still in kids clothes for most things so with these dresses being adult sized some of them fit kinda awkward. But the sleeves were so cool, I wish I had a better picture if the sleeves but they were kinda puffy and buttoned at the wrist. Please excuse the white denim jacket sprawled across the bench in this picture. For outfit three it was this cute white dress with orange and blue stripes. The dress kind of reminded me of a swim suit cover up with the material it was made out of. The thing that I didn't like about this dress was that it was see through and I didn't have a slip at home so I didn't buy it. I think this is a perfect dress for summer or if you aren't doing anything fancy for Easter. Maybe if it was paired with a pair of Jacks and some beach waves you could pull it off for Easter. This last outfit is probably my favorite! The dress is a pastel pink color with mustard and olive green paisleys. The dress is spaghetti strapped so I paired it with a mustard colored sweater. These are all of my outfit ideas! Comment below which one is your favorite. I will hopefully get to post a spring haul very soon because I recently got some super fun spring items!